When you make the wise choice to invest in a Micropub® Brewing System, you get a dedicated partner behind the tap with you every day. Located on the Fort Bragg military base, the newly renovated Iron Mike’s features the Micropub standard 4Bbl duel fermenter system. Iron Mike’s added kegging capabilities and a root beer system as well. It’s the beginning of a long and prosperous relationship! The Pearl Harbor Naval Base now boasts a fantastic new 5 fermenter system! With an additional root beer system, Club Pearl is set to satisfy their customers for years to come! The officers club at Fort Dix / McGuire AFB wisely accomodated a standard Micropub 4Bbl system in gleaming copper cladding during their latest renovations. With their kegging operations, they can port craft brewed beer out to the main bar, the banquet halls, or even the golf course! Now that’s a straight drive right down the middle! Beck’s installed an 8 BBL 3 fermenter system. The system is located on an elevated platform that used to house three booths. Monthly capacity of their own "Beck's Beers" is over 100 kegs. In addition, Beck’s added a soda system to produce Root Beer and other sodas. Smart moves all around! The Mohegan Sun is a large casino on an Indian reservation in Connecticut. The Micropub® Brewing Station is installed on two levels behind the bar in their new Race Book. They have an 8-barrel system with 2 fermenters. They also have a kegging system to supply other bars in their casino. They maintain 3 - 4 beers at all times. Bridges is a 150-seat neighborhood bar with Off-Track Betting, pool tables and video lottery. They installed an 8-barrel system with 2 fermenters with room for an additional fermenter. They brew primarily 2 beers; an Amber style and our Canadian Light. 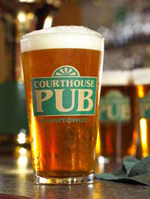 A sports bar in a small town in north Wisconsin situated in a renovated older building on Main Street. This bar has pool tables and indoor volleyball. The Micropub® Brewing Station is featured in the entry way in a brick and glass enclosure and can be seen from the street. They have a 4-barrel system with 2 fermenters. They also have had great success selling root beer brewed from the system. (12-16 kegs per month) Bugsy’s maintains between 2 and 4 beers on tap as well as the root beer. This is a U.S. Navy Officers Club on the Yongsan Base in downtown Seoul. They installed a 4-Barrel system with 2 fermenters. Expansion plans are being considered. The Dragon Hill Lodge is a large, 4-star hotel located on the Yongsan Garrison in downtown Seoul, Korea. This is a military hotel that houses U.S. Military personnel when they visit South Korea. The Dragon Hill Lodge has installed an 8-Barrel system in the Oasis Restaurant with a new, walk-out beer garden accentuating the Micropub® Brewing Station. The system includes a kegging system, and their goal is to distribute the beer internally to their other three bar locations. 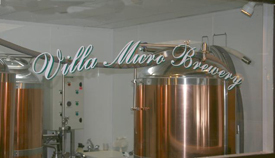 Originally built as a $600,000 full-grain brewing system fabricated by another brewery manufacturer, we were contracted to retrofit it to brew beer using the Micropub® process and Micropub® ingredients. When operated as a full grain system, the operators found the system too cumbersome, too expensive to operate, and too difficult to produce a consistently high quality product. This installation is a restaurant/bar in a small hotel near the Winter Park, Colorado ski area. This brewery is unique in that we installed the brewing station on a platform directly above the bar area. The beer has been very well received, and they are brewing to near capacity, especially during the peak skiing months. Kegler’s is one of over 500 company-owned bowling centers that AMF chose for its first test site. The Charlottesville system is an 8-Bbl, 2-fermenter brewery that currently produces between 50-60 kegs per month. This is an 8-Bbl, 2-fermenter system with kegging capacity servicing the newly remodeled Reggie’s Beverage Company at Fort Benning. The U.S. Army anticipates that Fort Benning will be used as their nation-wide training center for the Micropub® Brewing Station as additional systems are installed in Army bases around the country. This system is our biggest yet; 8 Bbl and 5 fermenters with a monthly capacity of 160 kegs per month. Club Alliance is the largest enlisted club in the world, and Yokosuka is the home of the U.S.S. George Washington carrier group and is the largest U.S. naval shore facility in the Far East. This is a large and high profile location that we anticipate will receive much publicity and follow-on business. This is an 8-Bbl, 1-fermenter system in a restaurant/bar in Regina, Saskatchewan. Like the Four Seasons Center, Mabel’s will have an unlimited “off-sale” endorsement which should allow their system to run to full capacity. Expansion with additional fermenters is anticipated.